Stay on a boat in Curaçao, Curaçao. 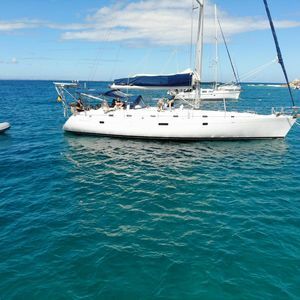 Our boat is a Beneteau 50 with 4 double cabines and each bedroom have is own bathroom. Also the kitchen is full equiped, a 3 pits stove, 2 fridges and a barbecue outside. The boat is located in Spanish water on a mooring serounded by villa's, the boat is not in a marina. You have your own dinghy to go to shore and back! We can lurn you to drive with dinghy! If you love freedom and adventure, than is this the place to stay on! Every cabin have a own bathroom, also outside you have lots of space to enjoy. There is outside also a barbecue and a dining table. The gasts have the entire boat totally privat. Everything you need is on the boat! At walking distance you can go to supermarket van Tweel, Zanzibar Beach bar and also to the gym. Everyday you can go with bus to supermarket Vreugdenhil, they pick you up at the fishers harbour. Every hour there is a citybus who goes to Willemstad, the maintown. You have the boat totally privat and your own dinghy, so you can go wherever and whenever you want. We are 24 hours in the area for help or for information. You can swim behind the boat and a beautiful beach is 5minutes drive with dinghy. About the marina/waterway The boat is not located in the marina but she is on a mooring in Spanish water surrounded by beautifull villa's. No direct neightbours and you can swim behind the boat. This feels like freedom!